Ba-dum BUM! is the first level in Yoshi's Island DS. It is similar to Make Eggs, Throw Eggs, the first level from the game's predecessor, Super Mario World 2: Yoshi's Island. Crazee Dayzees, Fly Guys, Glide Guys, Nipper Plants, Piranha Plants, Shy Guys, and Windbags are found here. The level icon is very similar to the game's predecessor. The name comes from the sound Yoshis make when they lay an egg. In this level, Yoshi starts out going straight until he runs into a Winged Cloud. Yoshi must hit the Winged Cloud with one of his eggs to create a staircase for him to climb. Up on this platform, Yoshi can find another platform he can jump to to get three Red Coins. Afterwards, Yoshi must land on a pipe and must find another Red Coin. In the pipe, Yoshi can use Baby Mario's dash ability to collect a bunch of coins. 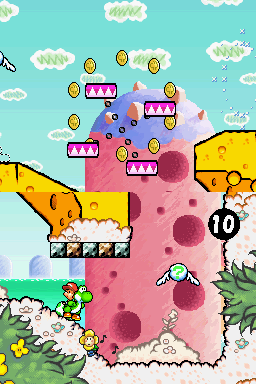 After collecting the coins, Yoshi must leave the cave and hit the Expansion Block to jump up onto a ledge. From the ledge, Yoshi runs into another Winged Cloud. Yoshi must hit it with an egg to reveal five stars. Afterwards, he jumps back to find a paddle wheel with some coins on it, some that are Red Coins. Yoshi must jump off the paddle wheel to jump up onto a ledge. Here, he can find some more coins with a Red Coin mixed in. Yoshi must continue to find an Crazee Dayzees and a Winged Cloud. Yoshi must defeat the Crayzee Dayzee and hits the Winged Cloud to grow a beanstalk. At the top of the beanstalk, Yoshi can find a paddle wheel with more coins on it, some of which are Red Coins. He then jumps off to the left and hits another Winged Cloud, which reveals a staircase which leads to a clifftop with three Red Coins, a Flower, and a Fly Guy with an extra life. Yoshi must head back to the paddle wheel and must get to the Middle Ring. Here, a Windbag makes its appearance trying to stall Yoshi while shooting Nipper Spores at him. Yoshi can go in a nearby pipe to discover the first Baby Coin in the game. He can then go back through the pipe to get to an area with several Shy Guys, Fly Guys and Glide Guys trying to block his path. After that, Yoshi can hit a Winged Cloud which yields five Stars when hit. Shortly after, Yoshi encounters the goal roulette. This page was last edited on April 12, 2019, at 08:48.